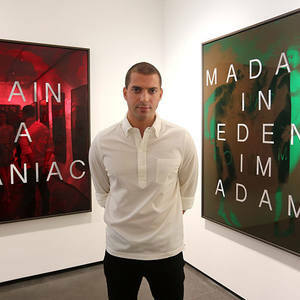 MASSIMO AGOSTINELLI (b.1987) Massimo Agostinelli is an Italian American contemporary artist from New York living and working in Switzerland. Born in London and graduated from Webster University whilst pursuing apprenticeships in typesetting and typography as well as other forms of print making. Agostinelli specialises in drawing/painting photography and printmaking, primarily working with text art using various forms of 'word play' and 'visual poetry'. Focusing on traditional and innovative cutting edge technologies using a wide variety of mediums and techniques within a diverse spectrum of crafts. Agostinelli has gallery representation in major cities around the world including several museum exhibitions and participation in a multitude of prestigious art fairs. Agostinelli's work can be found among the finest international art collections both private and public.